I had three days off due to the Columbus Day holiday but a heavy cloud cover decided to park itself over the entire region, so most of the photos you’ll see here were taken under gray skies. But this makes things interesting for me, because there is a long running argument that says colors “pop” better on cloudy days than they do on sunny ones. For me it depends. If the sun is behind me and I’m looking at the sun shining on the foliage the scene can be very beautiful, but on cloudy days you don’t have to worry about where the sun is. 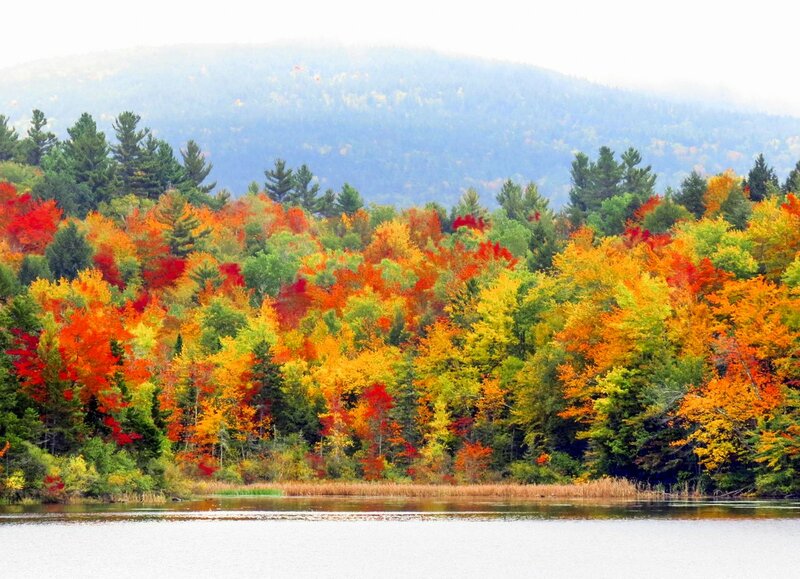 The colors still “pop” but in a different way, as this view from Howe Reservoir in Dublin shows. Mount Monadnock would have shown in the background if not for the low clouds. 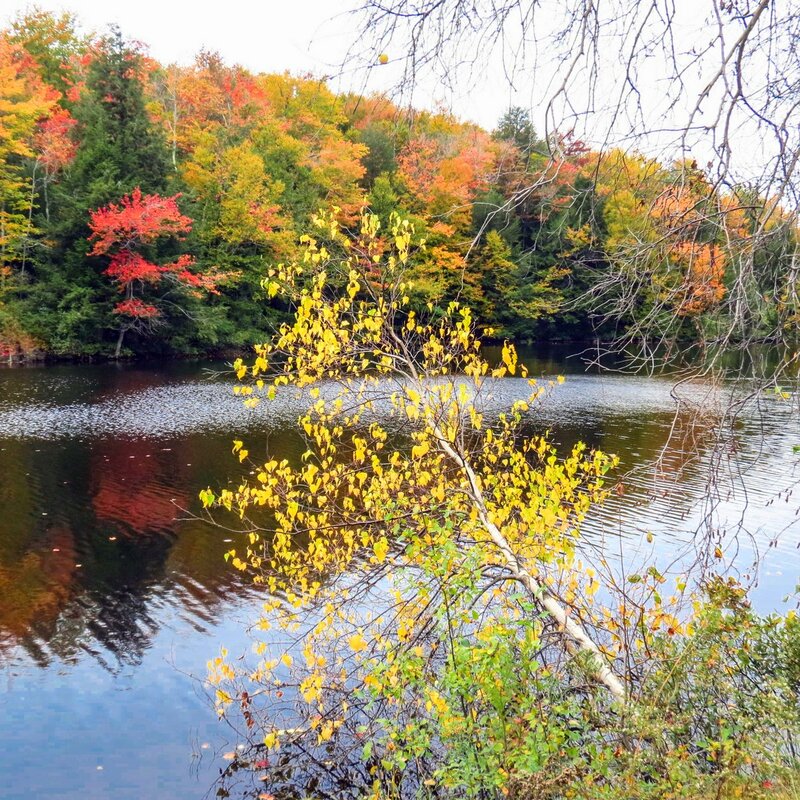 I moved along the shoreline of the reservoir trying to get shots of the best color. An Asian couple did the same, taking selfies with their phones, presumably because the people back home would never believe this. Actually I’ve heard that there are people who think it couldn’t be real; that the colors had to have been faked somehow, but then they came here and found that nature can indeed be pretty colorful. We still haven’t reached peak color yet so many trees like oak and beech are still green. 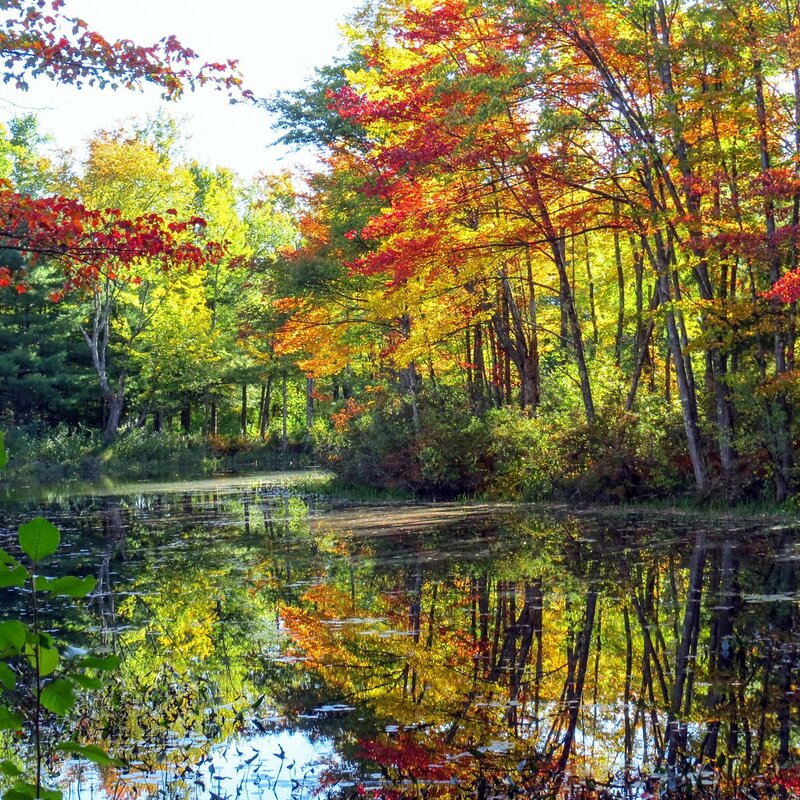 It seems to start in swaths or pockets throughout the forest before finally the entire forest is ablaze with colors of every hue. I watch the hillsides that surround Keene and when they are showing quite a lot of color that’s my signal to start climbing and try to photograph it from above. So far I haven’t had much luck but I keep trying. My breathing is ragged this year so I’ll probably only get one try. I’ll try to make it a good one. Birches tend to grow in groves, often mixed in with other species, so it’s hard to isolate a single tree to show you their fall leaf color, but this one conveniently leaned out over the water all by itself. They don’t vary much from the clear yellow that you see here, although I have seen red and orange leaves on birch trees occasionally. In the fall blueberries come in yellow, orange, red, and the plum color seen here. They grow wild around our lakes and ponds. I can’t think of a single body of fresh water I’ve been on in this state that didn’t have blueberries on its shores. They are very common and their numbers are staggering. 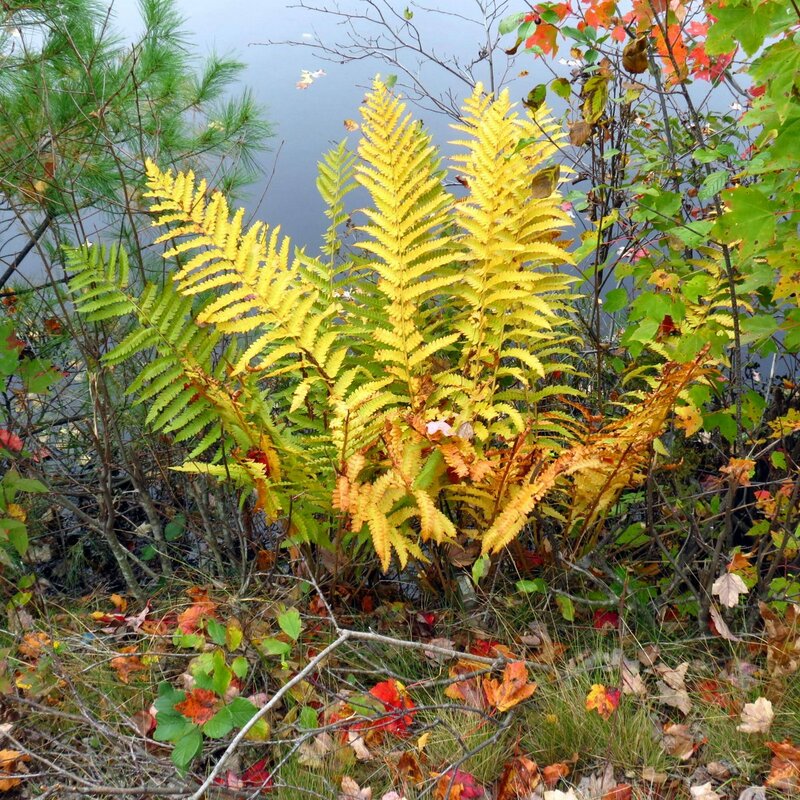 In the last fall color post I showed some cinnamon ferns that were orange. Usually their cousins the interrupted ferns (Osmunda claytoniana) also turn orange but this one at Howe Reservoir was bright yellow. Sometimes just a single tree seems enough. 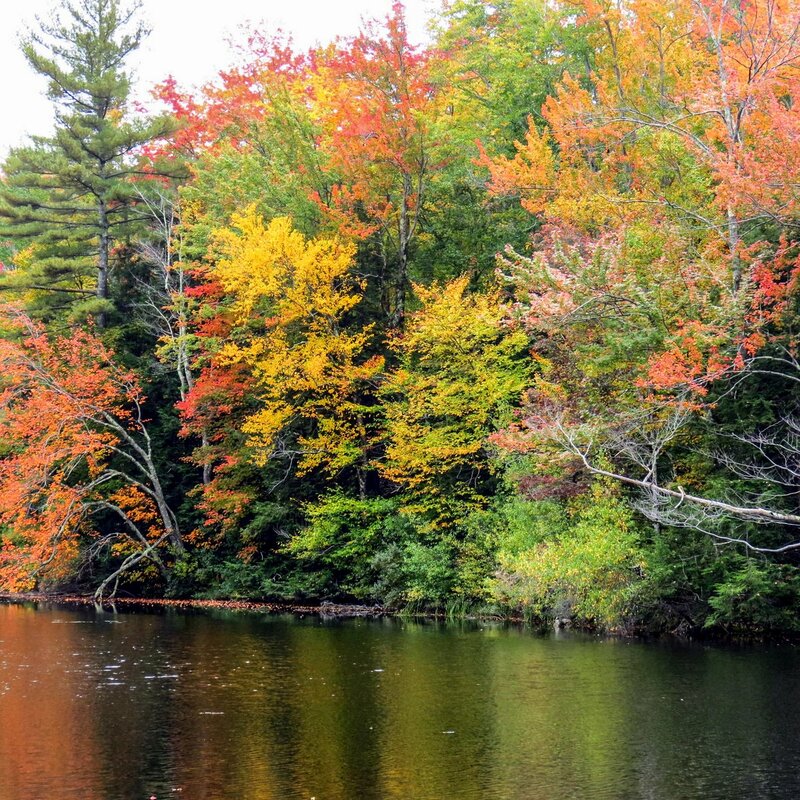 But a single tree can never match the beauty of an entire forest wearing its fall colors. The asters were a bonus. Red maples (Acer rubrum) don’t mind wet feet so they are often found it wet places, and that is why they’re also called swamp maples by many people. 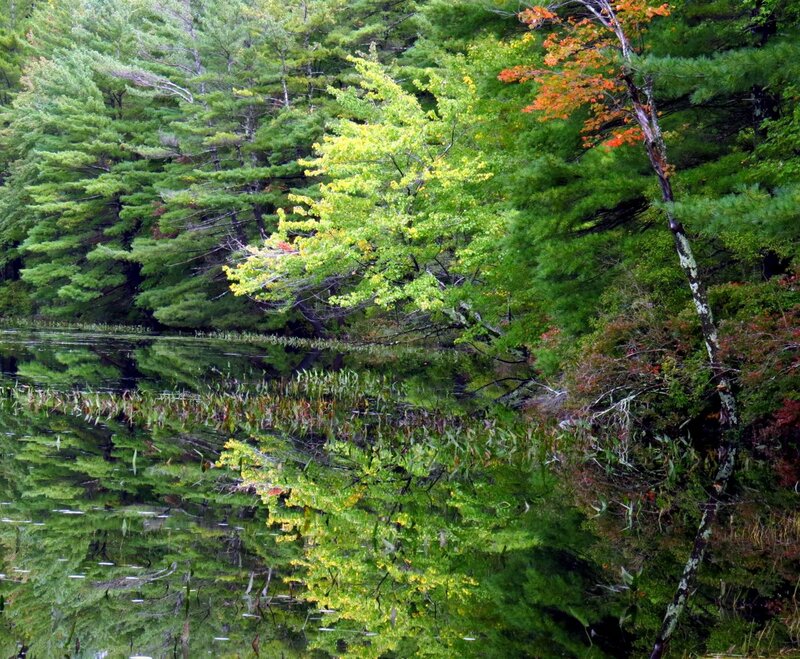 In fact some swamps are called red maple swamps. 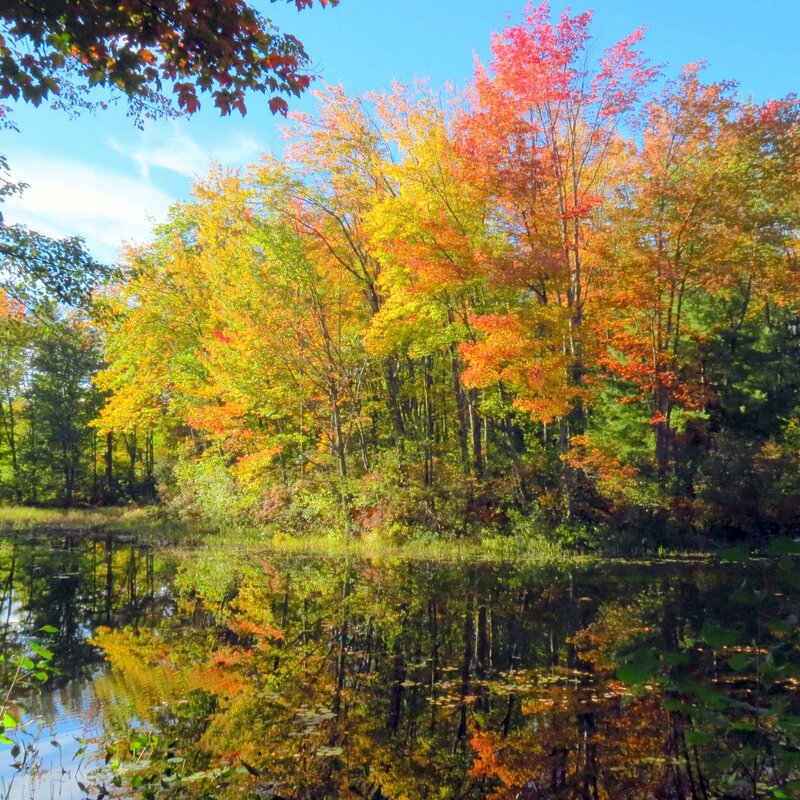 As this view into a swamp shows they come in various shades of yellow, orange, red and are one of our most colorful fall trees. They’re also called soft maple and scarlet maple. These trees can get quite big; the largest known red maple lives in Michigan and is 125 feet tall with a circumference of over 16 feet. Both main roads and back roads are getting colorful now. 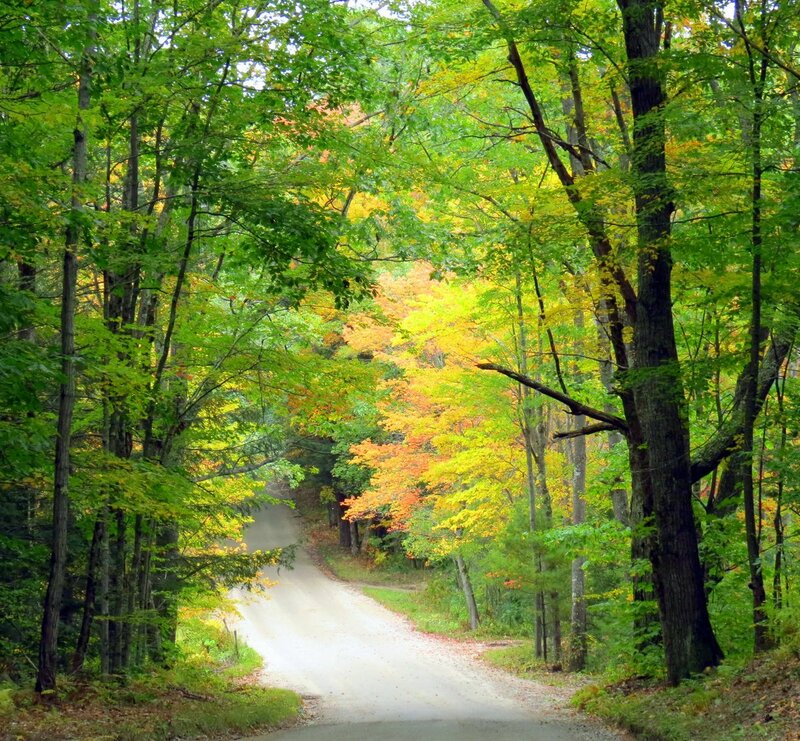 You don’t realize how many people come to see the foliage until you drive a road like this one. Usually you can walk on this road and not see a car all day, but on this day it was like a super highway. I had to wait a while to get a shot with no cars in it. 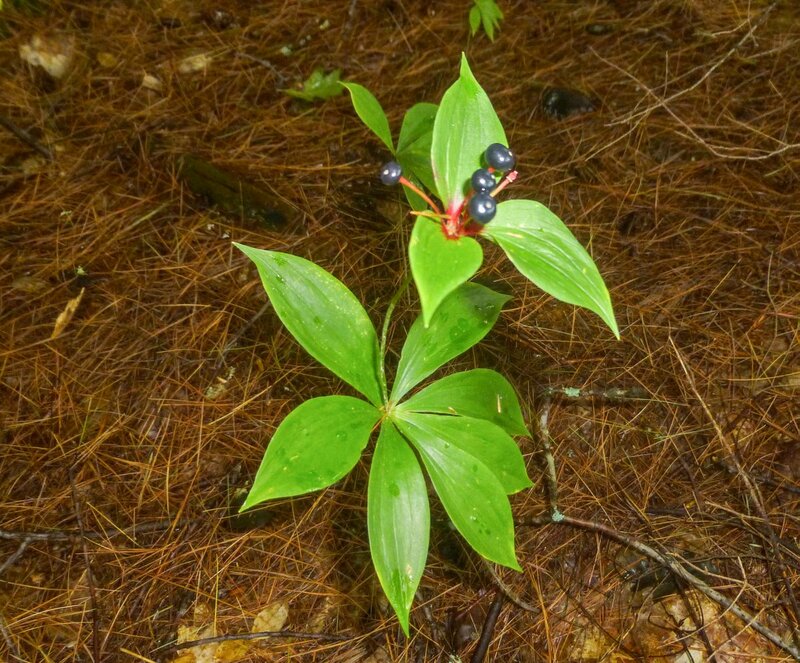 False Solomon’s seal (Maianthemum racemosum) had colorful leaves but no berries. They get eaten fast and I haven’t been able to find any ripe ones yet this year. I still haven’t seen any scarlet poison ivy (Toxicodendron radicans) leaves but I did see some that I thought were pink. Unfortunately my color finding software sees the sky reflected off the leaves and thinks the few leaves in the lower right corner are several shades of blue. 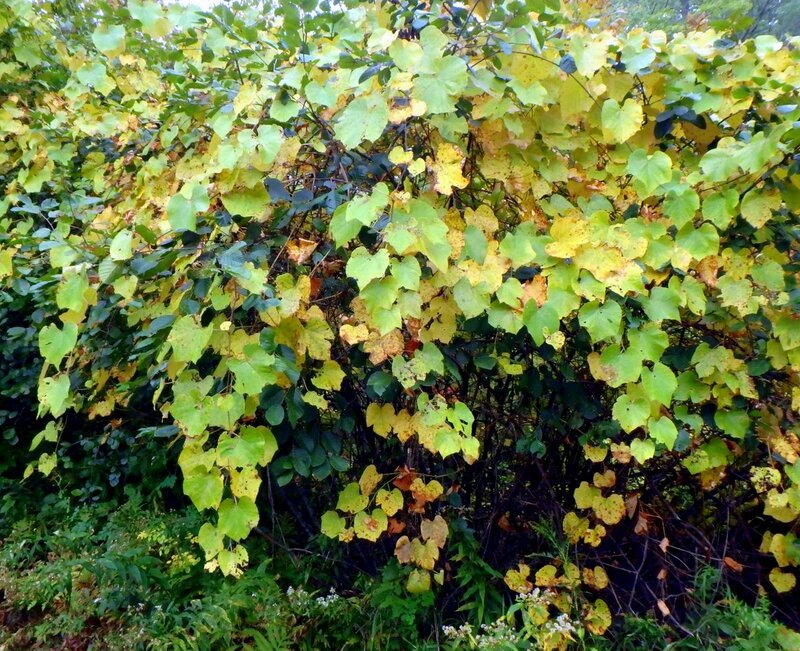 Wild river grape leaves (Vitis riparia) turn yellow in the fall and this is a great time to find them because they stand out better now than at any other time of year. 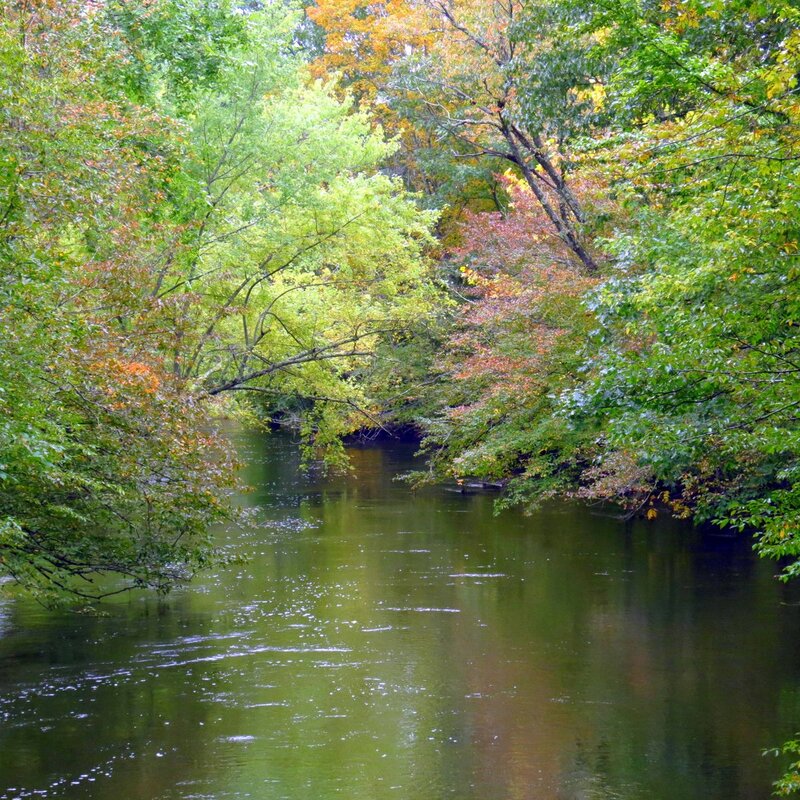 I couldn’t let a warm and dry fall day go by without visiting the Ashuelot River. I started in the northern part of town and sure enough the tree that always changes before all the others had done it again. I can’t get close to it so I have no idea what it is, but it’s always early. After visiting the northern part of town I visited town center at Ashuelot Park. 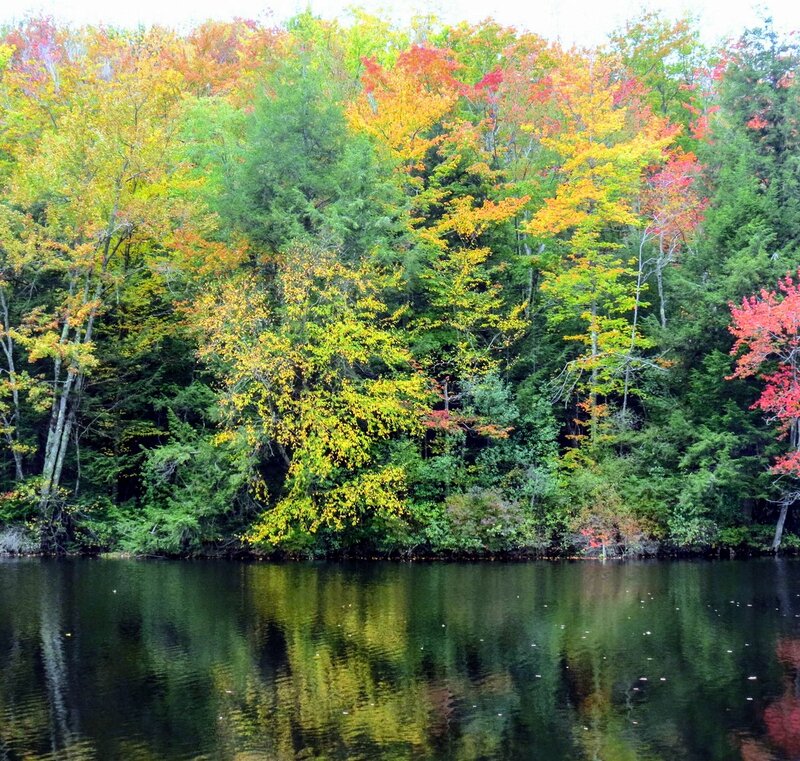 This stretch of river is one of my favorites in the fall because the banks are lined with colorful maples. You have to come here relatively early though, because many maples change early and that means they drop their leaves early. In a week or so when I’m at other places admiring colorful foliage the trees here might be all but bare. 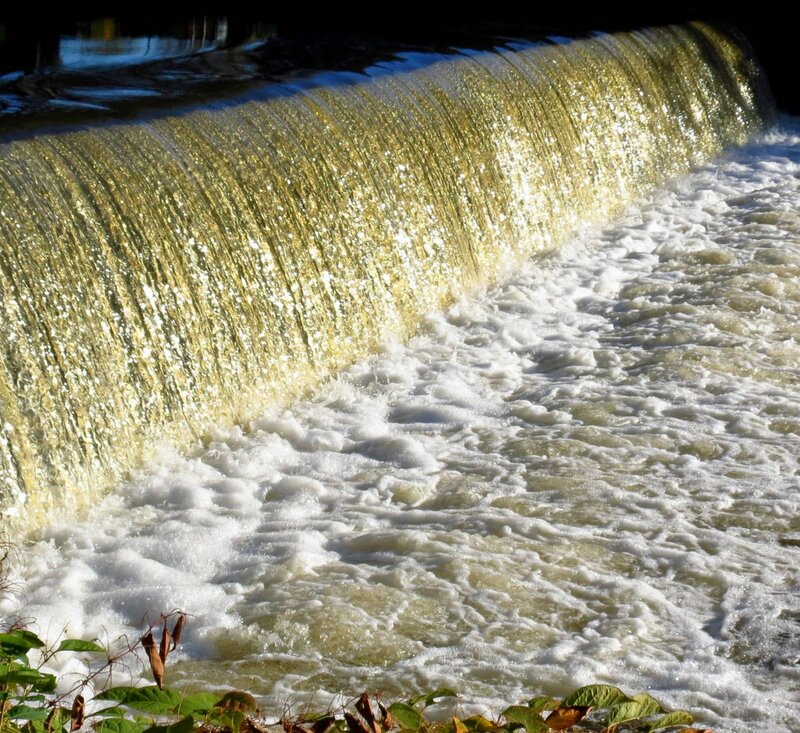 The falls over the old Colony dam on West Street turned to molten gold in the afternoon sun. One of the reasons I love to come here at this time of year is because of the way the afternoon sun sets the trees ablaze with color. It’s beautiful and seeing people just standing and staring or taking photos is common. One girl with a camera told me she comes here every day. 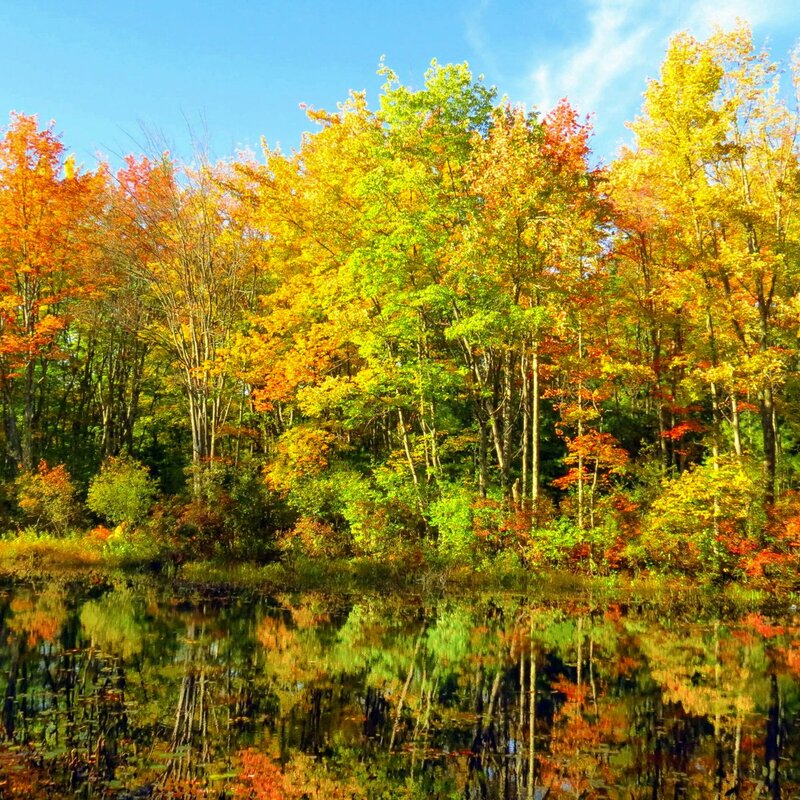 It’s a place people come to immerse themselves in the beauty of fall. But which is more beautiful, the sunlight coming through the trees or falling on the trees? I can never decide so I always get shots of both. The colors are amazing no matter how you look at them. 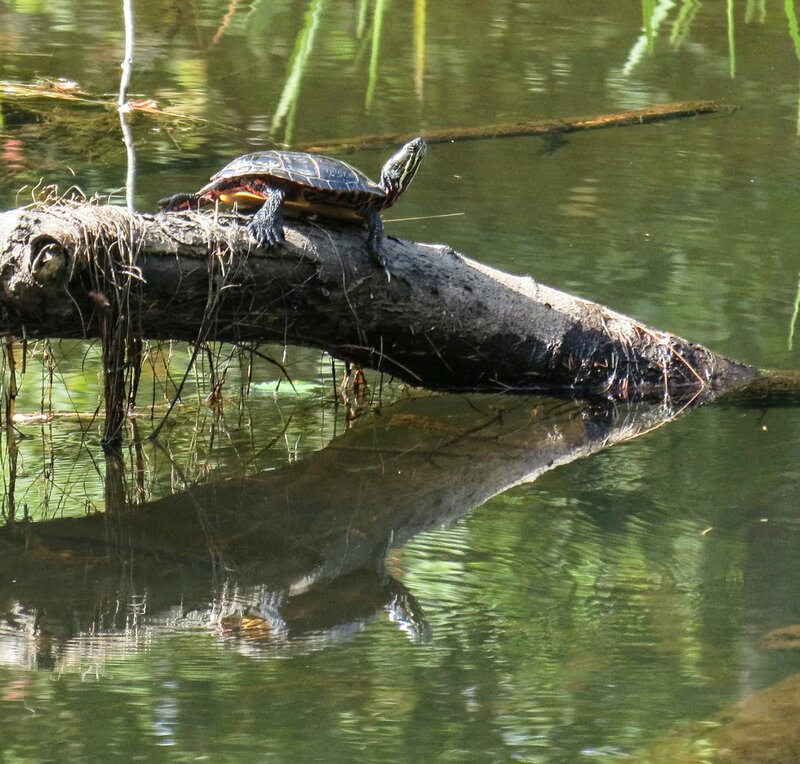 I’ve been looking at this shot of a turtle on a log for nearly a week now, trying to think of what I wanted to say about it. What a lucky turtle is about all I can come up with. Not profound maybe, but I wouldn’t have minded spending some time on that log myself. I can’t imagine being any more immersed in nature than that. 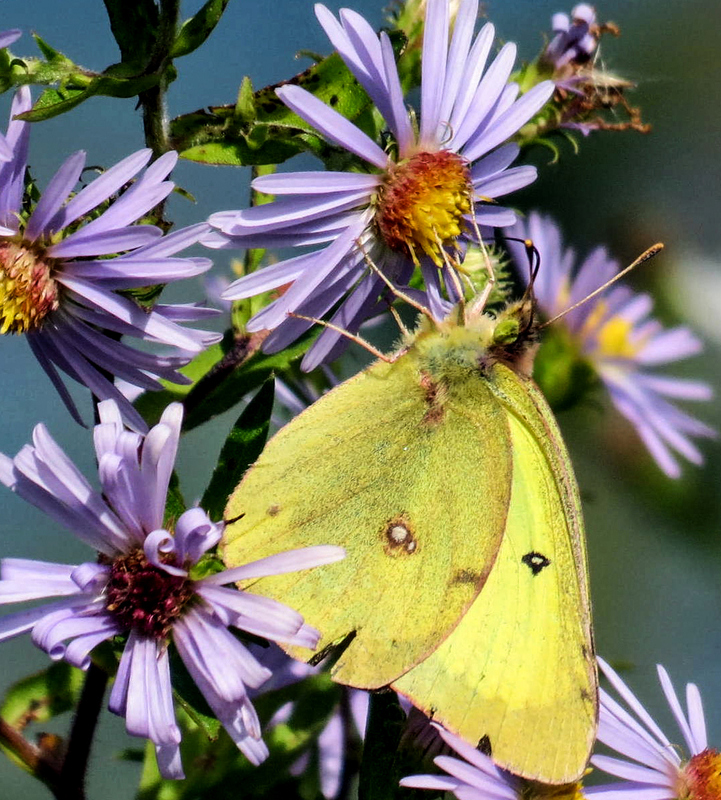 I saw a clouded sulfur butterfly (Colias philodice) on an aster recently. It moved from flower to flower but was willing to sit still long enough for a couple of photos. I like the color combination. 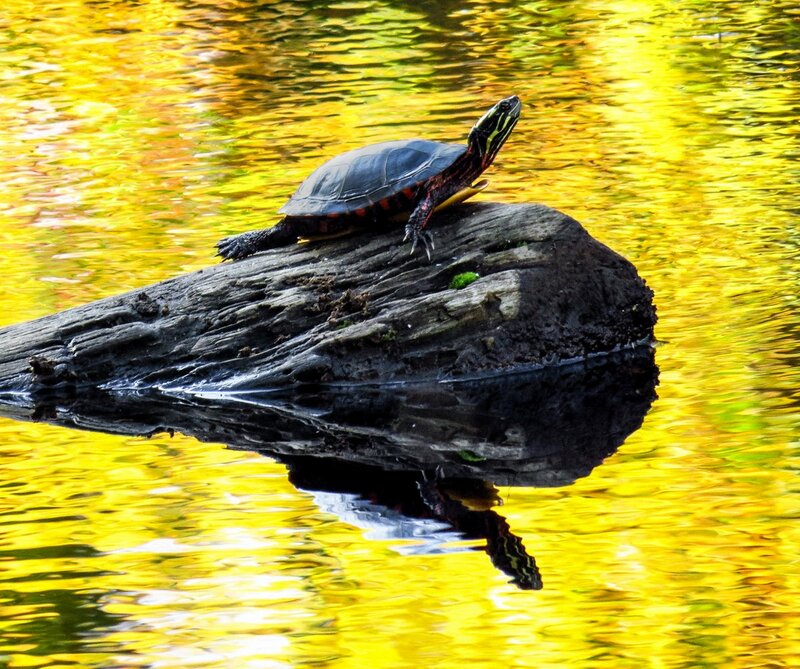 Painted turtles are still lazing in the sun along the Ashuelot River. Soon they will burrow into the mud on the river bottom. As the water cools their internal temperature will drop to nearly match the water temperature and their metabolism will slow. They will take up enough oxygen to stay alive through their skin and hibernate until the weather warms in spring. The American dagger moth caterpillar (Acronicta americana) feeds on the leaves of deciduous trees like birch, elm, ash, hickory, maple, and oak. This one had someplace to be and was moving about as fast as I’ve ever seen a caterpillar move. It had a black head but it wouldn’t let me get a shot of it. 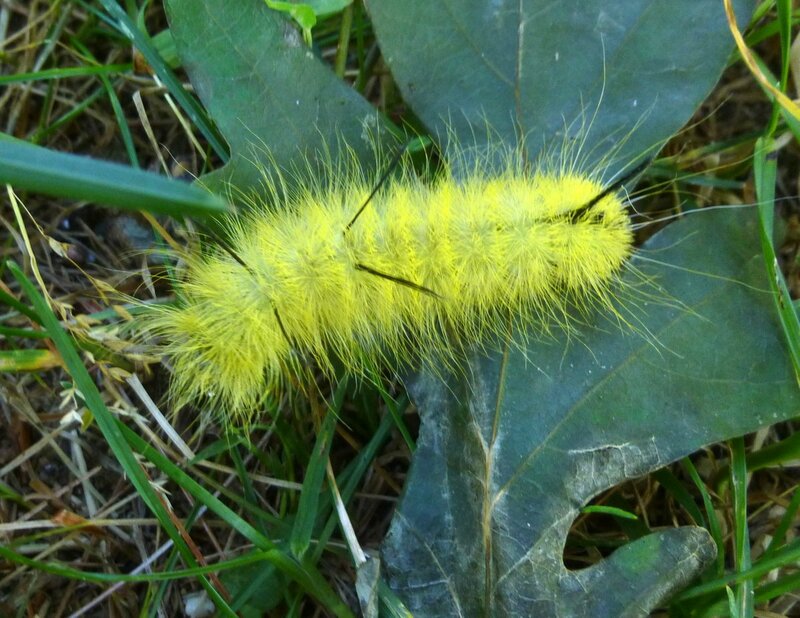 American dagger moth caterpillars aren’t poisonous but some people do get a rash when they handle them. A coworker found a moose antler in the woods and I asked if I could get a photo of it for those who have never seen one. This was from a young moose and wasn’t that big, but some can get very big indeed. 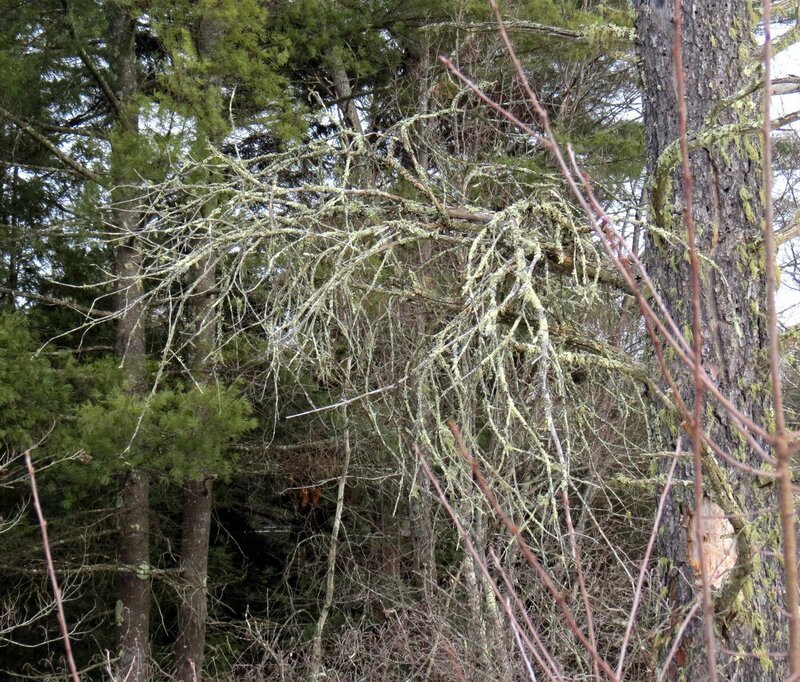 One recent trophy moose had antlers that spanned over 6 feet (75 5/8 inches) from tip to tip. Shed antlers aren’t a common site in these woods even though moose wander through every town in the region. 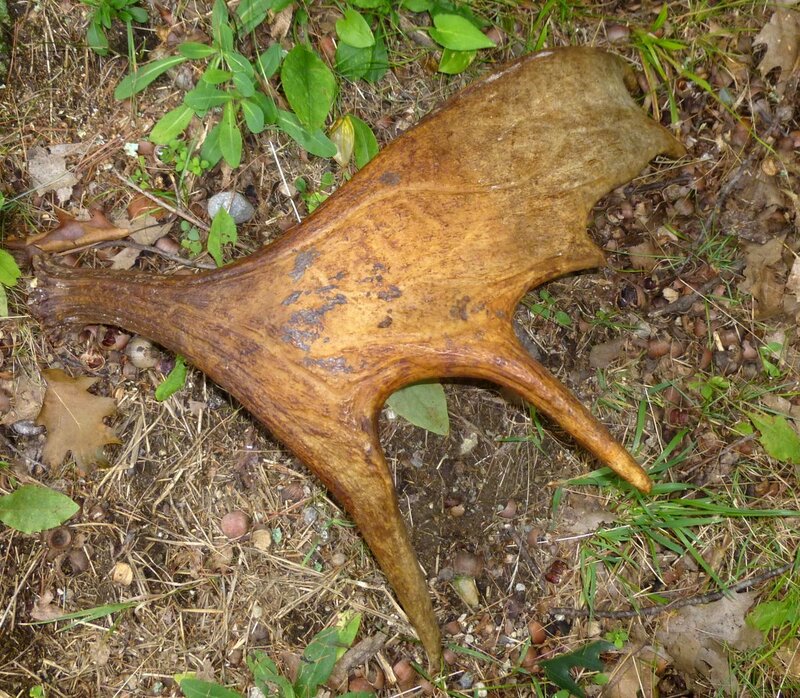 Since they are relatively rare large moose antlers can be valuable when found in good condition. 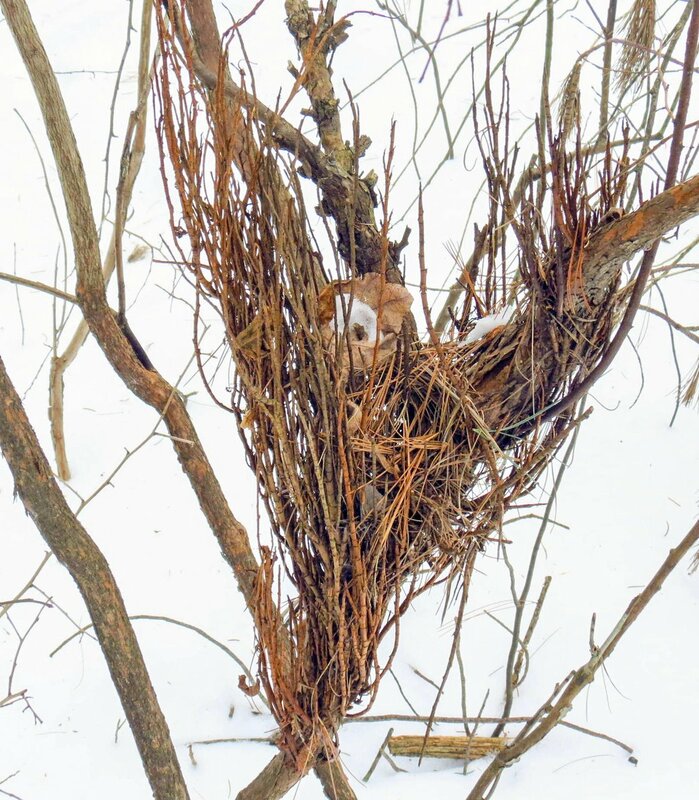 The trick is to find them before the mice, birds, coyotes and other critters chew them up. 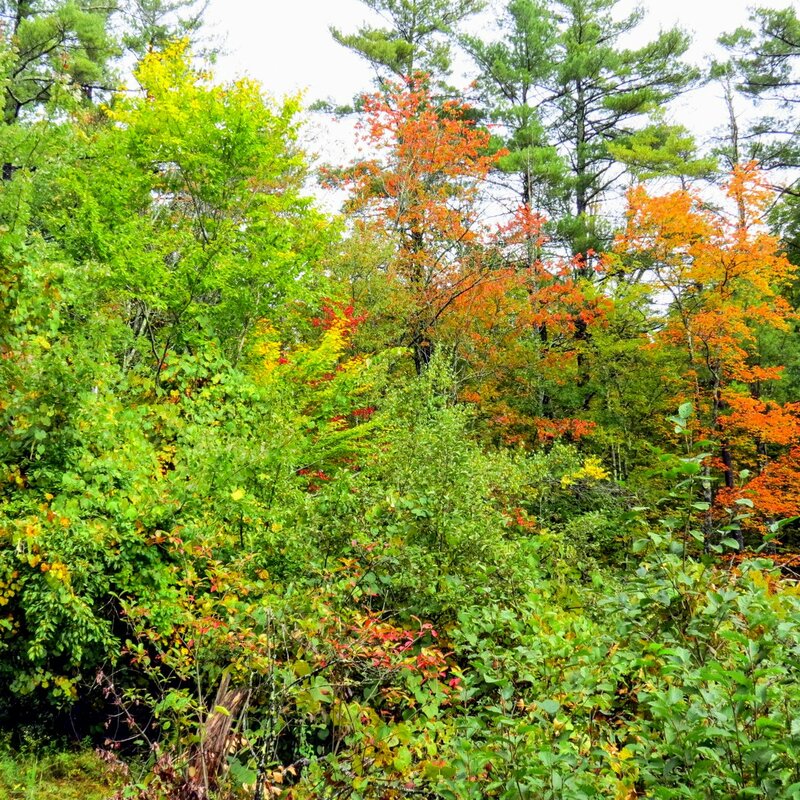 Fall always seems to start at the forest floor and slowly work its way up to the trees. At present it has reached the understory, as this Virginia creeper (Parthenocissus quinquefolia) shows. I grew up with this plant; my mother loved it so much that she planted it to grow up the side of the porch. I watched it turn red each fall when I was a boy and now I look for it every year at this time. 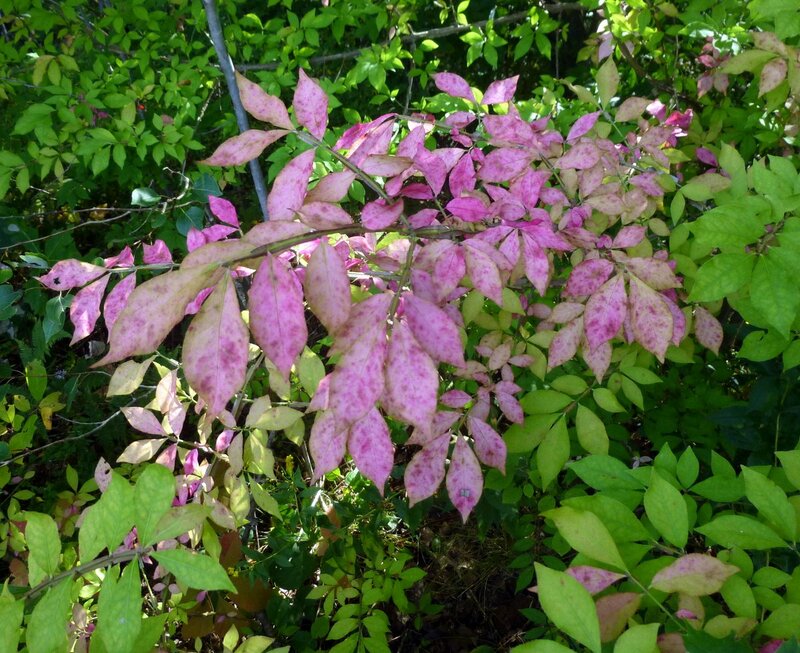 Burning bushes (Euonymus alatus) are also showing signs of fall, with more pink leaves coming every day. 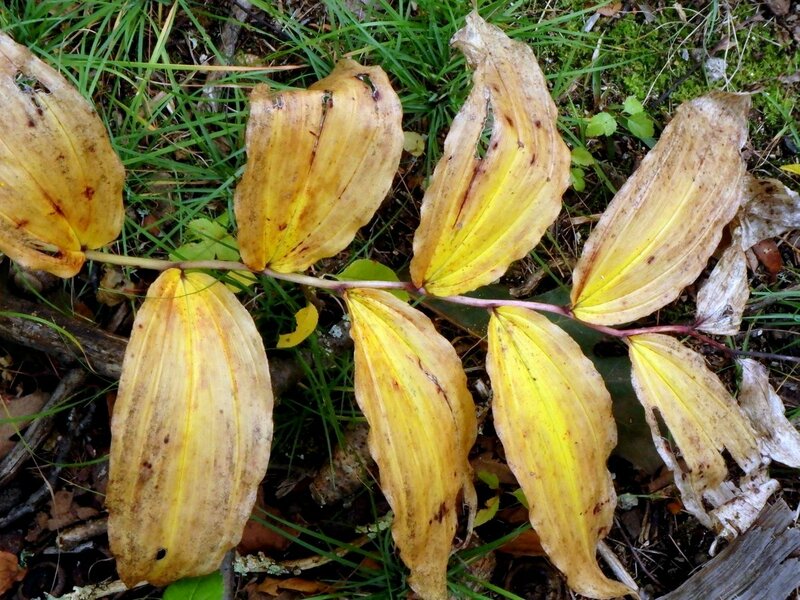 This shrub is much loved for its fall color but it is extremely invasive so its sale and cultivation are banned in New Hampshire. 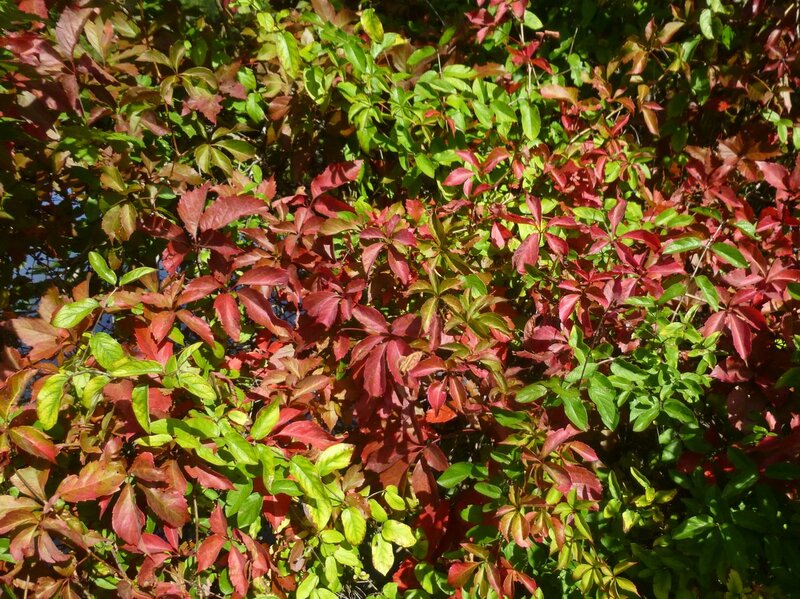 Our native highbush blueberry bushes (Vaccinium corymbosum) are quite colorful in the fall and are good alternatives for burning bush. 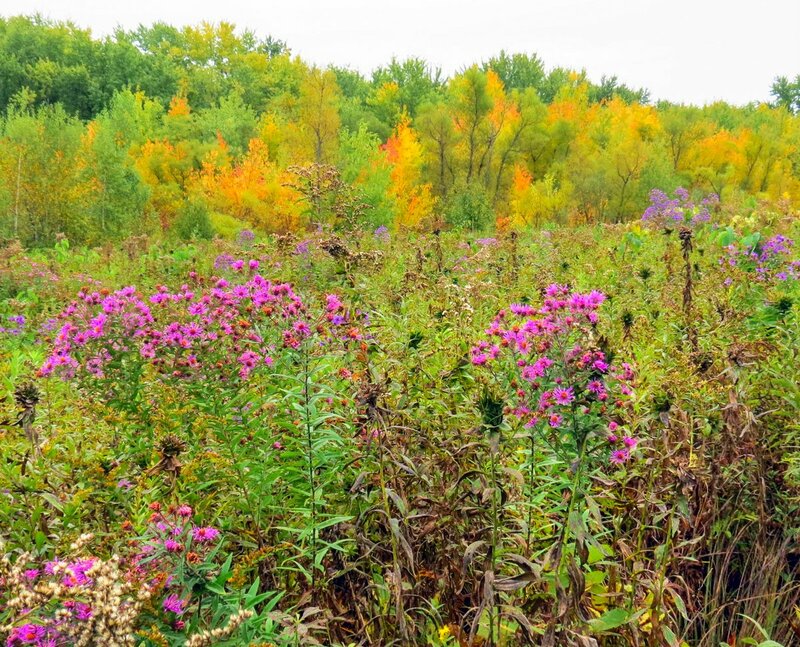 Plant breeders have developed cultivars that are even more colorful than the natives. 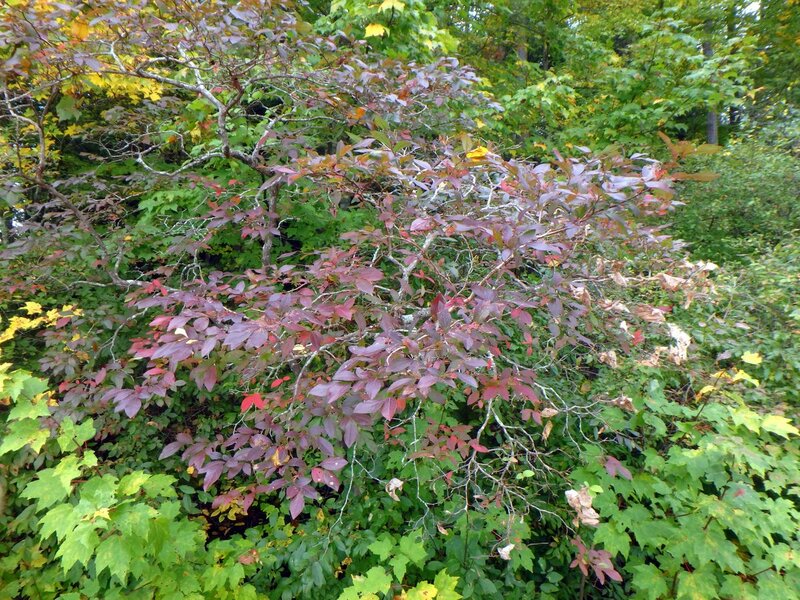 The American cranberry bush (Viburnum opulus var. 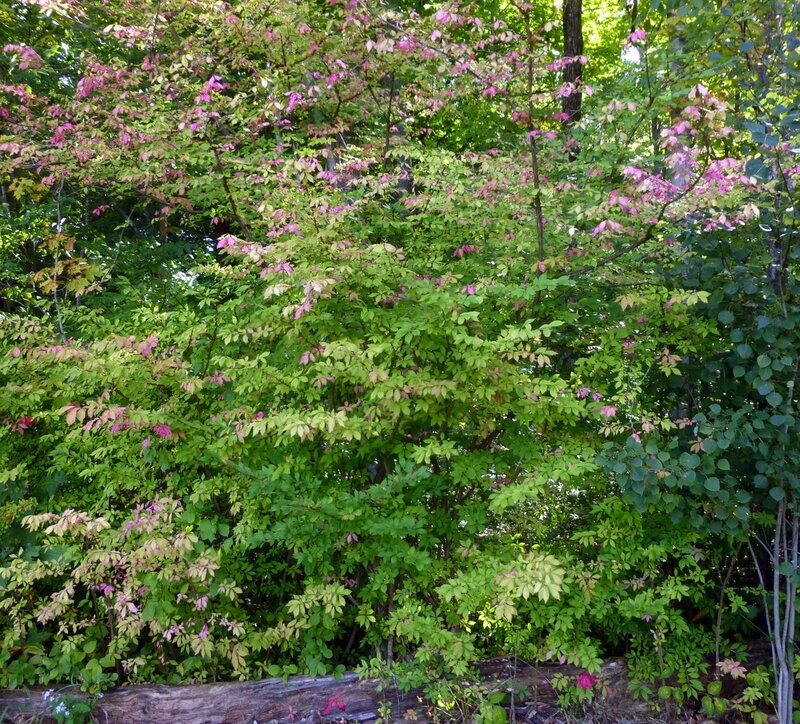 americanum) is another native shrub that breeders have been working on and some cultivars display amazing color. They may be invasive but it’s hard to deny the beauty of burning bushes. 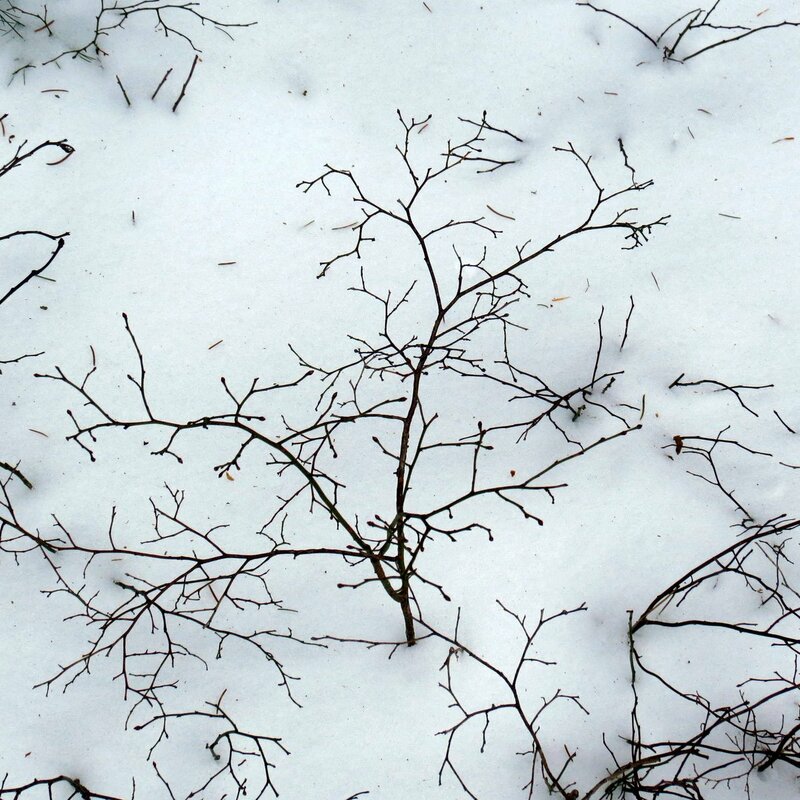 Along the Ashuelot River in Swanzey there is a narrow strip of woodland where nearly the entire understory is made up of hundreds of these shrubs. 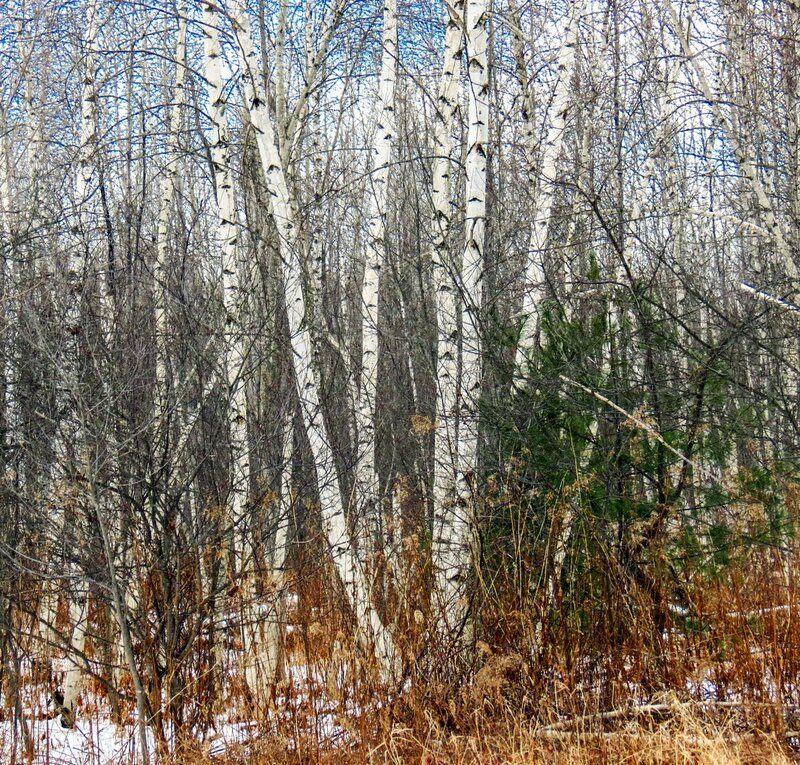 It’s a great example of how invasive plants choke out the natives and create a monoculture. I’m not happy about the monoculture but when all of these shrubs turn the color of the leaves shown in the photo it’s an astoundingly beautiful sight. Though I can understand and even agree with every argument that says they should be destroyed, I have to admit that I’d be sorry to see them go. 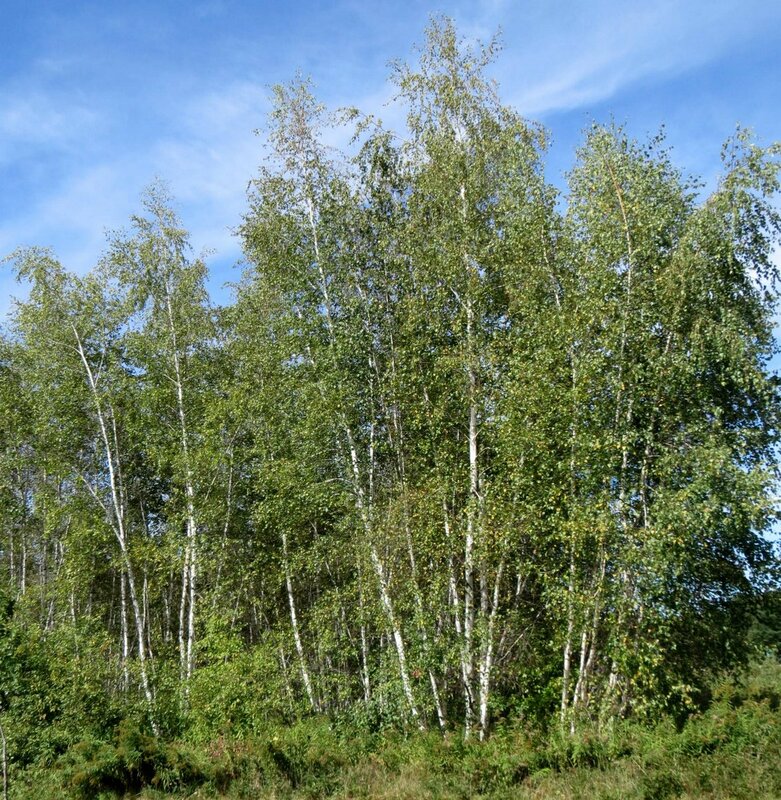 Birch trees are among the first to turn in the fall but these examples are still showing more green than gold. We’ve had a very dry summer and I’m curious to see what the colors will be like this year; muted or more intense? So far the shrub colors don’t seem to be affected. 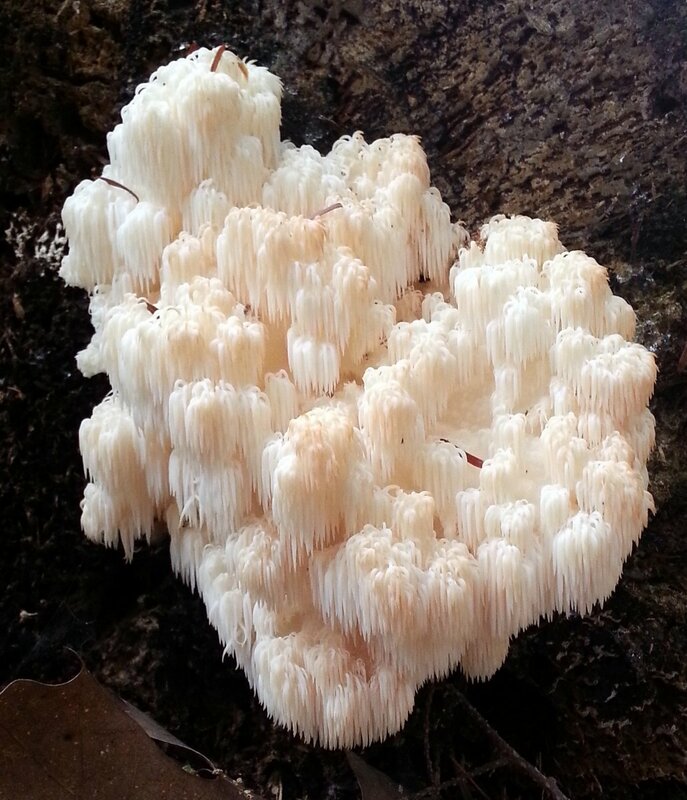 Bear’s head or lion’s mane mushroom (Hericlum americanum) is a beautiful toothed fungus that looks like a fungal waterfall. 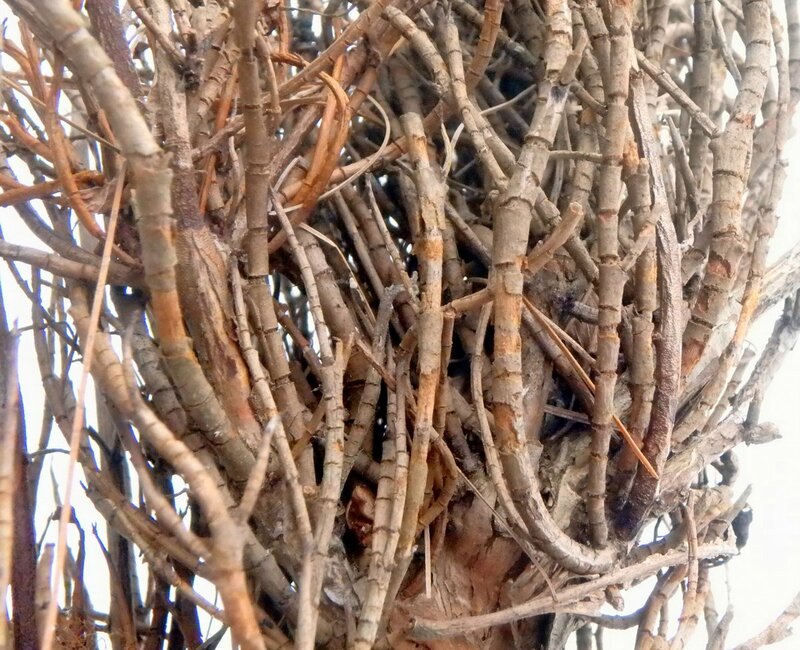 Soft spines hang from branches that reach out from a thick central stalk. 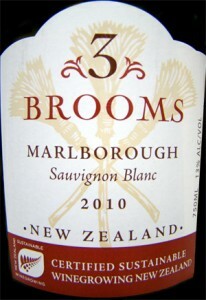 As it ages it will change from white to cream to brown. I didn’t think I was going to see one this year but I found this naval orange size example growing from the cut end of a felled tree just yesterday. I took its photo with my cellphone because that’s all I had with me. I haven’t had much luck taking close-ups with that phone so I was surprised when I saw that this shot was useable. 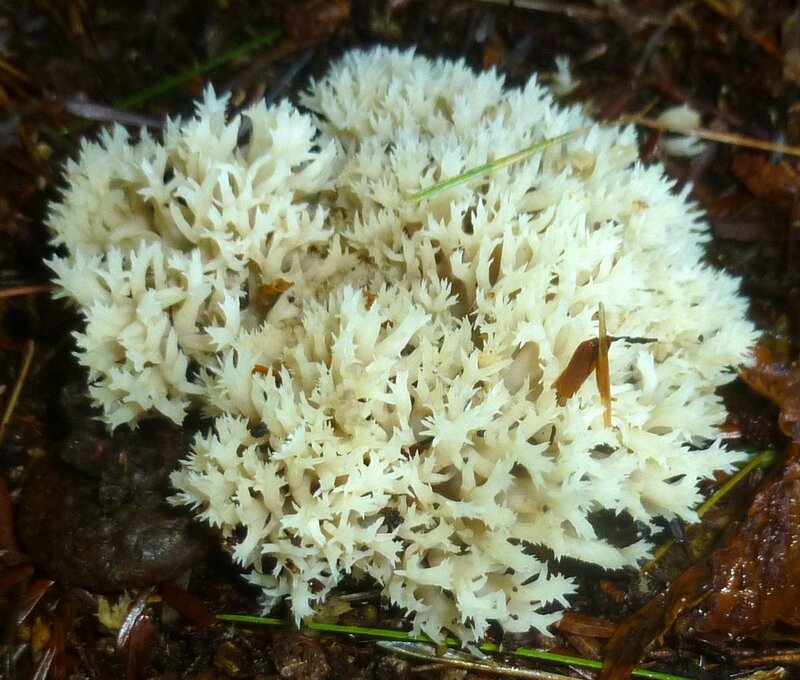 I think this white coral fungus might be cockscomb or crested coral (Clavulina coralloides.) Crested corals have branches that end in sharp tips which often turn brown. I don’t see these as often as I do other types of coral fungi. 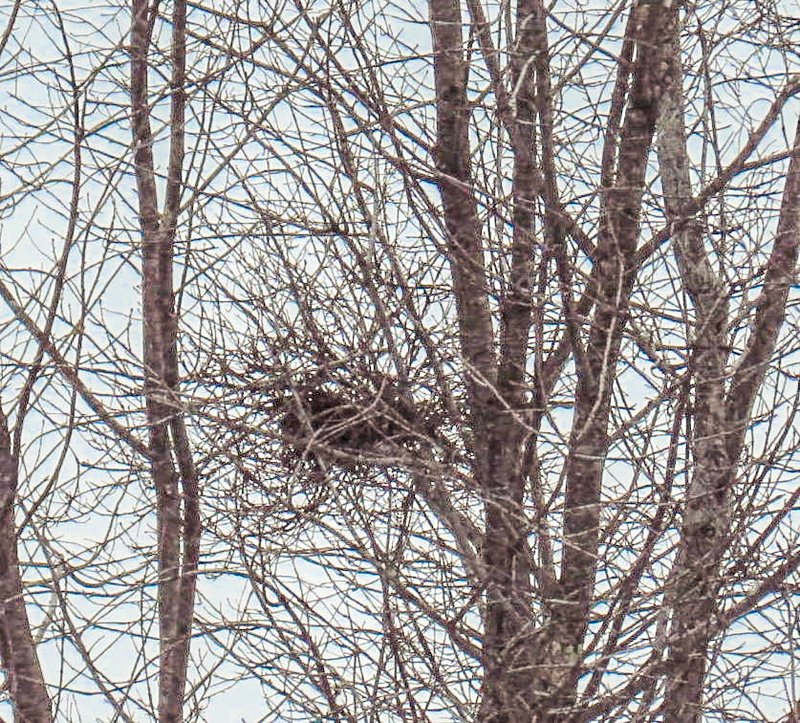 They are supposed to like growing under conifers and that’s just where I found it. 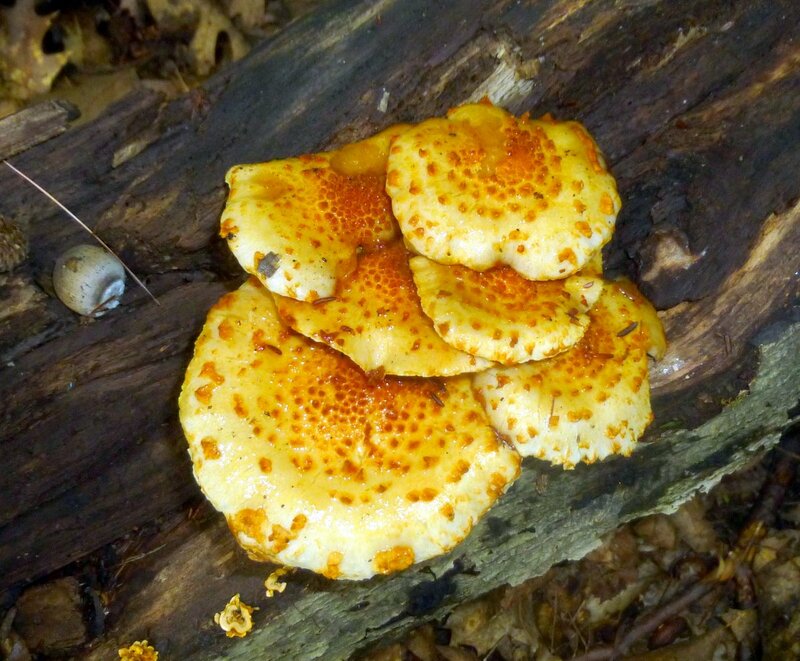 Golden pholiota (Pholiota limonella) mushrooms grew on a beech log. The gilled, lemon yellow caps with reddish scales are slimy to the touch on these inedible mushrooms. An oak kindly dropped an acorn beside them for me so I could give you a sense of their size. 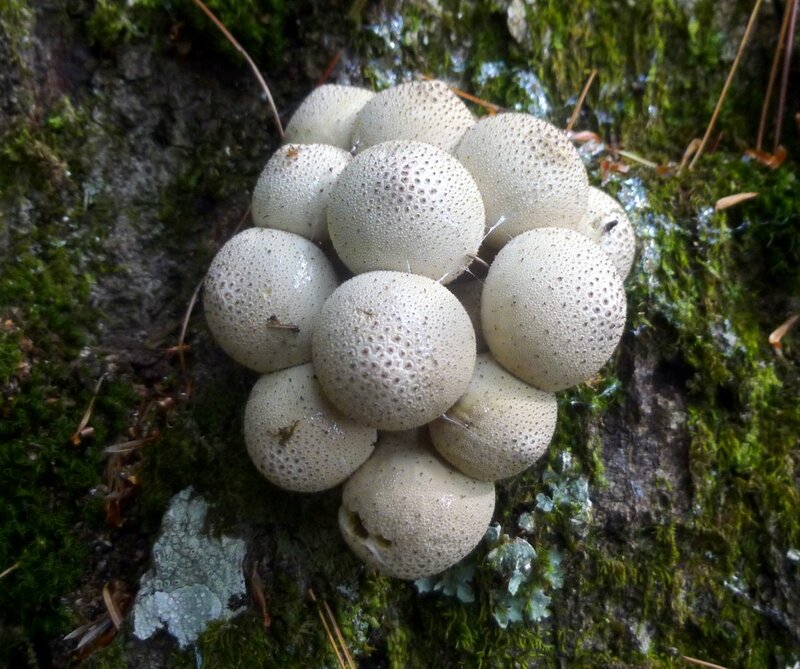 Pear shaped puffballs (Lycoperdon pyriforme) grow in clusters on stumps and logs but these examples were growing on a rotted part of a living, standing tree. That’s not good and the tree will eventually have to go. Their common name comes from their upside down pear shape which can’t really be seen in this photo. 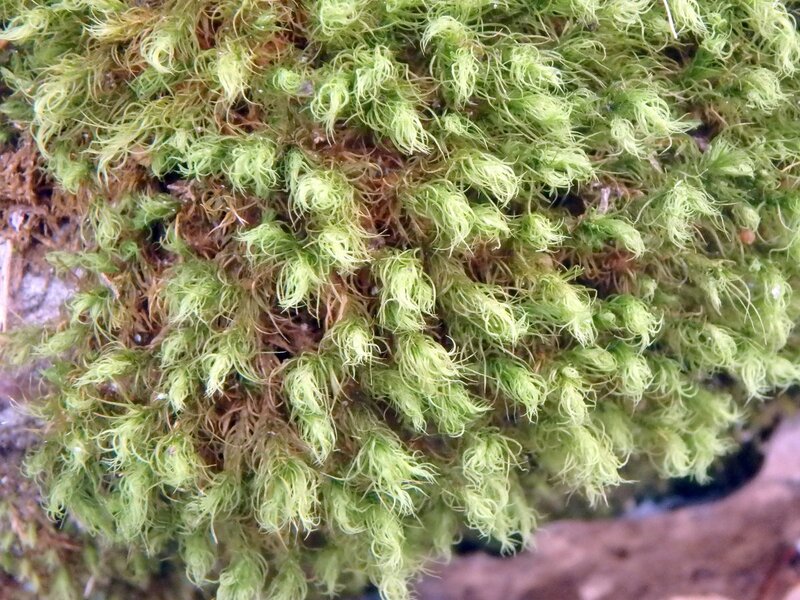 As they age pores open in the top of each one so its spores can be released. The wild plums are ripening. I found a thicket of about 3 small trees under some power lines in Swanzey a few years ago and though I’ve taken photos of the flowers I never came back to take any of the fruit until this year. 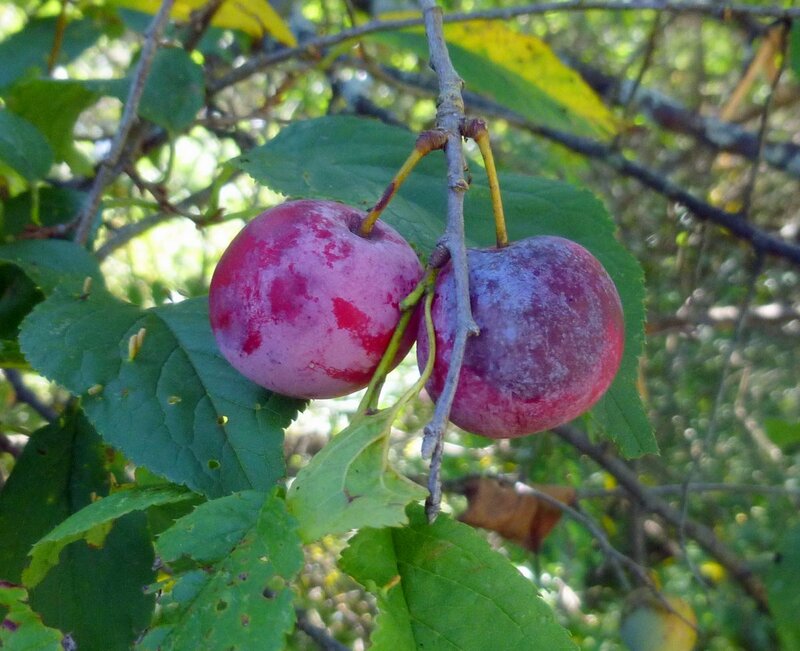 I thought they were American plums (Prunus americana) but I’m not positive about that. They could also be Canada plums (Prunus nigra.) I’m going to have to pay very close attention to the flowers next spring. The fruit is small at about half the size of a hen’s egg but is said to make delicious jelly, whether American or Canadian. 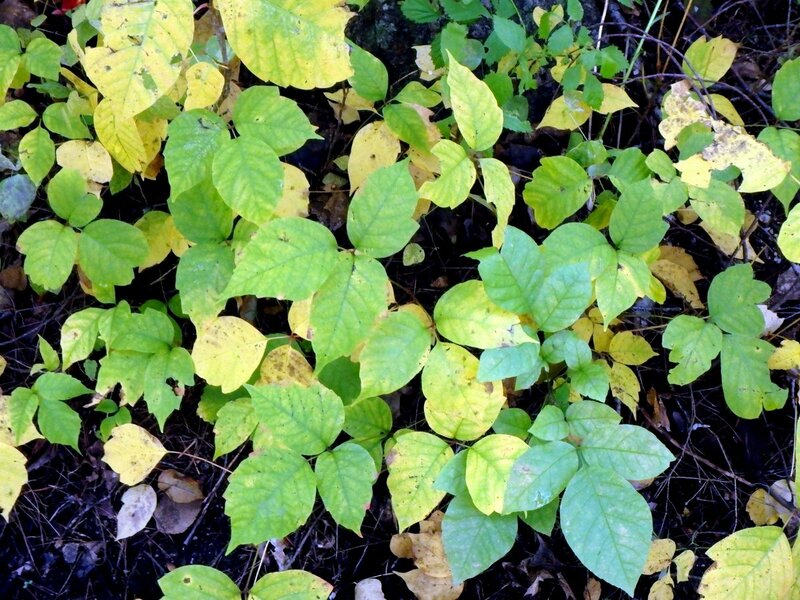 Botanically speaking a whorl is an “arrangement of sepals, petals, leaves, stipules or branches that radiate from a single point and surround or wrap around the stem,” and nothing illustrates this better than Indian cucumber root (Medeola virginiana.) Its leaves wrap around the stem arranged in a single flat plane, so if you saw them from the side theoretically you would see an edge, much like looking at the edge of a dinner plate. If any leaf or leaves in the arrangement are above or below others it’s not a true whorl. Native little bluestem grass (Schizachyrium scoparium) catches the light and glows in luminous ribbons along the roadsides. 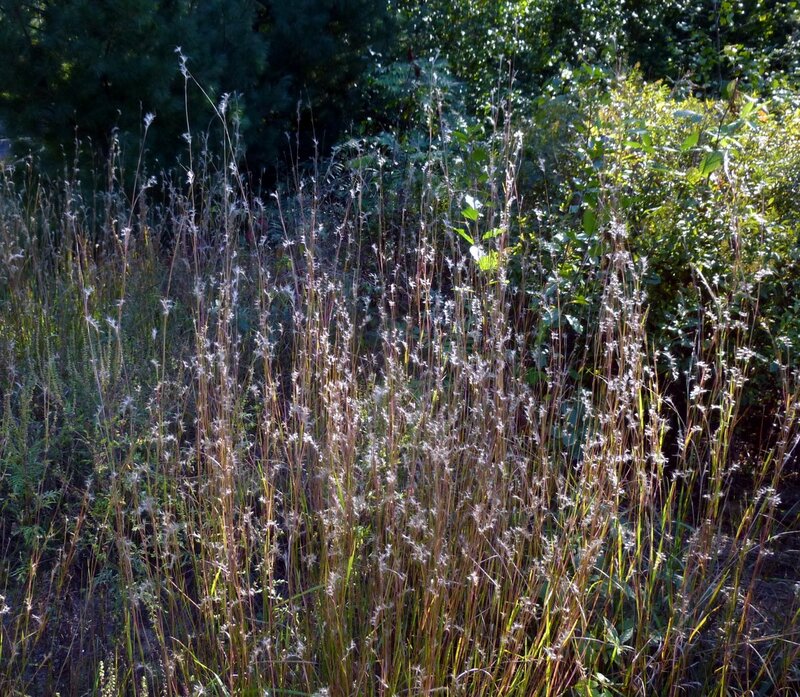 This grass is common, growing in every U.S. state except Nevada and Washington. According to the USDA its appearance can vary in height, color, length of leaves, flowering, and clump diameter from location to location. 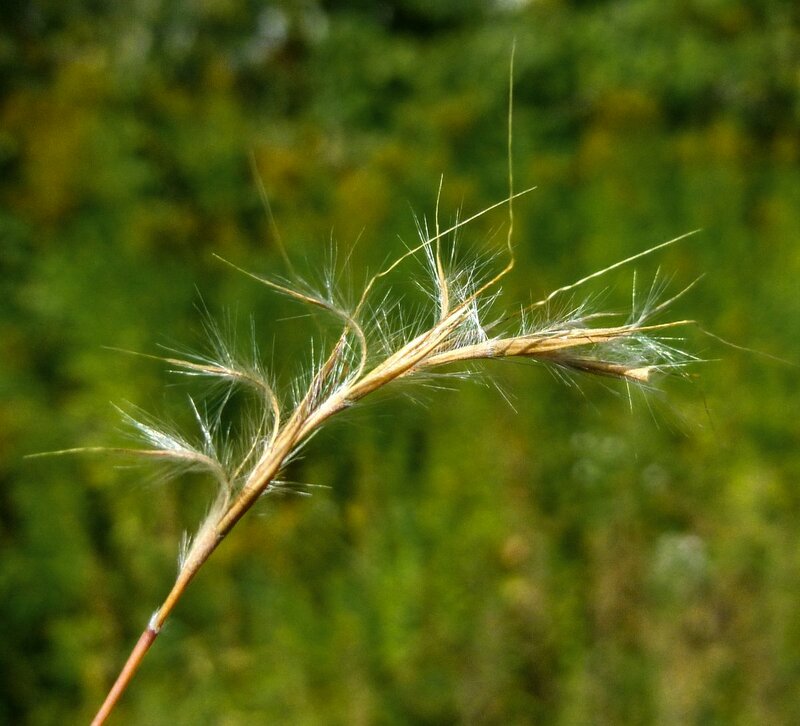 It’s a beautiful little 2-3 foot tall grass that lends a golden richness to life outdoors. After a frost it takes on a reddish purple hue, making it even more beautiful. 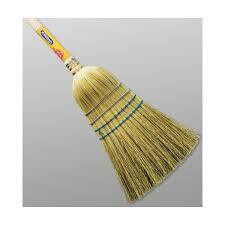 The world would be a duller place without it. There is a lot going on in a light catching little bluestem seed head but I won’t try to explain it; I’ll just let you enjoy its unique beauty. 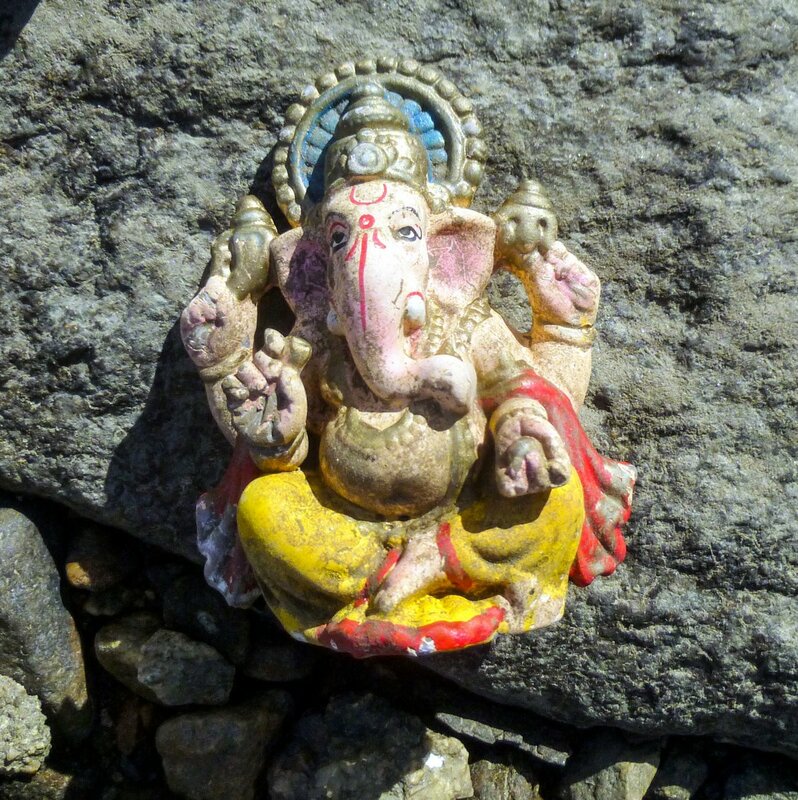 I’ve been walking the banks of the Ashuelot River almost since I learned how to walk and I’ve seen some unusual things over the years, but by far the most unusual thing I’ve seen recently is this statue of the Hindu deity Ganesh that I found on its banks in Swanzey. Ganesh is said to be the lord of success and the remover of obstacles on one’s spiritual path. He is also thought to bring education, knowledge, wisdom and prosperity, so I’m wondering what it is the river is trying to tell me. It seems like whatever it is can only be good.